This article is a short summary of Mario Party 9. 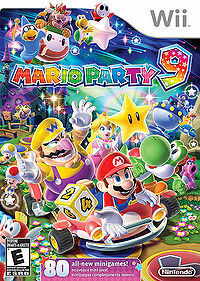 Mario Party 9 is the ninth main installment in the Mario Party series, released for the Wii in 2012. Notably, this is the first game in the series to not be developed by Hudson Soft, as they had recently been purchased by Konami; Mario Party 9 was instead developed by Nd Cube, by many of the same people who had developed the previous Mario Party titles. Ride together and compete to defeat the Boss! Travel with your rivals in vehicles! Take out Bowser's minions in boss battles! Collect the most Mini Stars! The party is back and bigger than ever in the Mario Party™ 9 game for Wii, featuring all-new ways to play! For the first time in the franchise, boss battles crash the party and challenge players to compete to defeat a common enemy. In addition, players now travel across stages together in a vehicle towards a common goal - overcoming obstacles, battling bosses, and collecting Mini Stars stolen by Bowser™ and his minions. Featuring 80 new minigames, adventurous new stages, and all-new ways to play that blend cooperative and competitive action for up to four players*, Mario Party 9 is the perfect way to get the party started. For the first time in the Mario Party franchise, each stage culminates in a Boss Battle. Collectively, players must combine their strength to defeat classic foes such as Bowser™ and King Boo while still playing competitively to boost their own individual scores. The game's Story mode begins with Mario and friends looking into the night sky with a telescope, when they see a vortex sucking up all of the Mini Stars. As it turns out, Bowser is the one behind the Mini Stars disappearing, as he is using a vacuum machine to take them all for himself. Mario and friends set out to defeat Bowser and reclaim the Mini Stars, though they are followed by Shy Guy and Magikoopa, who plan to foil the group per Bowser's orders. Like previous Mario Party games, the main game of Mario Party 9 revolves around a boardgame setting. However, Mario Party 9 differs from previous Mario Party games in that all characters travel around in one vehicle toward the end of the board, as opposed to moving around a board separately. Players roll a six-sided die, which moves the vehicle forward. All throughout the board are Mini Stars and Mini Ztars, which add and subtract from the player's Mini Star total respectively, and the player with the most Mini Stars at the end of the game is the winner. Players can earn Mini Stars by passing by them on the board, winning minigames, and from board events. Rather than play minigames at the end of each turn, players instead must land on a Minigame Space to initiate a minigame. In the middle and at the end of each board is a Boss Battle Space, which players must stop at and face one of Bowser's minions in battle to earn Mini Stars. This game also introduces Bowser Jr. minigames, in which two players must team up to beat Bowser Jr. In addition to the Story and Party modes, players can also play various minigame modes, as well as being able to freely play any of them. Players can also unlock new features, such as party vehicles and extra modes, using the Museum. This page was last edited on 4 November 2018, at 18:45.